With some last-minute withdrawals, we saw 40 Elite Women line up, select their positions on the start line and … as the tension built, look out at the 750m swim course. LaLiga Sports, once more covering the event, took us right into the race. The wind was making it quite a challenge and so the stronger swimmers would be the ones to benefit. A small lead was made out at the furthest point and as they headed back to the shore, it was time for those stronger swimmers to make it uncomfortable for those behind by pushing the pace, with long, hard pulls under water. No surprise at all when Austria’s Therese Feuersinger was first to hit the carpet. She did this a couple of years ago to great effect but behind her now was Iria Rodriguez ESP, Jolien Vermeylen BEL and then Diana Isakova RUS and Alessandra Tamburri ITA. Out onto the bike and Austria still led, with Rodrigues and now Ilaria Zane ITA in contention. Tamburri by her side and, looking good, France’s Margot Garabedian. Valentina Riasova RUS led Alicja Ulatowska POL and the home crowd’s favoutire, Cecilia Santamaría Surroca was still there. Almost 40 seconds back was Yulia Yelistratova UKR but this early in the race and there was not much to worry about, such is her bike and particularly run strength. 12 athletes struggled to keep Feuersinger in sight. The tall Austrian simply powered her legs, attacked out of each turn and as she rode along the seafront, was able to look across to the other side of the road and gauge how far ahead she was. The clocks showed 20 seconds. Santamaría was being cheered on by the crowds. She had Lisa Berger SUI, the Brits, Kate Waugh and Zoe Thomas, Riasova, Zane, Garabedian, Italians Elena Maria Petrini, Federica Parodi, Beatrice Mallozzi and Carlotta Missaglia, Xisca Tous ESP, Rodriguez and Vermeylen with her. Some strong cyclists in the group but they needed to work together to catch Feuersinger and to keep away from Yelistratova, who was in the third group, catching up on the chase pack. Feuersinger continued to pile on the pressure and as she left the main arena, she could see that she had made up a little more ground on her last lap. The stopwatches now showing her to be 26 seconds ahead. The chase pack had joined the main group and Yelistratova’s group was now 20 seconds off that pace. The main group, with its fast runners, knew that they could not let Feuersinger get too far ahead, Careful riding around the downtown Melilla streets was essential but taking a turn at the front was also needed. Sharing out the pain at the front of the pack and trying hard to catch the Austrian gave the crowds a great show. The supporters along the course were now cheering out loud each time the athletes came past. Attacking now, the chase pack had eaten into the lead and reduced it down to just 8 seconds. Feuersinger kept her head down and did her best to maintain the lead but with the power that was being generated from within the chasing pack, it was Zoe Thomas who dragged them up to the Austrian. Thomas has shown great power on the bike the recent events and she stormed past the race leader. The leading group was now 14 strong and having pulled away so effectively, it looked unlikely at this stage, that the medals would come from anywhere other than these athletes. The variety of this bike course, its sea front, its city centre and the turn in the main arena, makes it a wonderful design and although there are no hills, there are plenty of technical challenges for the athletes and spectators to enjoy. As the last lap began, the pack was led by Feuersinger. 14 athletes and a lead of 45 seconds ahead of Kseniia Levkovska AZE, who was in non-man’s land. Coming to T2 and it was Feuersinger who led them in. It was Mallozzi who led them out. Zane, Riasova Tamburri Missaglia. Another Italian attack on the cards? Zane pushed to the front and Audrey merle, having been absent front the front of the peloton, was there. Santamaria edged forwards, the cheers rang out as the Spanish crowds saw their favourite. Lisa Berger was there. Merle kept the pressure up as Zane, Mallozzi, not looking so relaxed, Santamaría and Berger broke away from the group. The 30m advantage was under threat at the turn point. Merle still led. 12 seconds back came Riasova. As they headed towards the main arena and the noise from the crowds, listening to the bell, they were able to see just how far ahead they were. Riasova, now 9 seconds back, was digging deep. Feuersinger, Mallozzi and Maria Czesnik POL, despite giving many years away to the younger athletes, was holding on. Mallozzi kicked once back on the road. Zane followed. Merle kept the two Italians in sight but as Mallozzi showed her running skills (she is one of the fastest in the Italian team) that invisible piece of elastic got pulled tighter and tighter. Zane moved closer to her teammate and then they were running side by side. Mallozzi, suffering from a stitch from the start of the run was not looking as comfortable as usual. Santamaria was laying in 4th but dropping back. Mallozzi kept the pressure high and Zane was forced to ease up, still in silver medal position. 5 seconds at the last dead turn and Zane saw her teammate ahead. The smile came over Mallozzi’s face as she hit the last sweeping turn and she could her the noise from the finish area and the cheering of the crowds. It was an amazing third gold for the Italian team, with the bonus of silver for Zane. Merle returned to the circuit with a solid bronze. 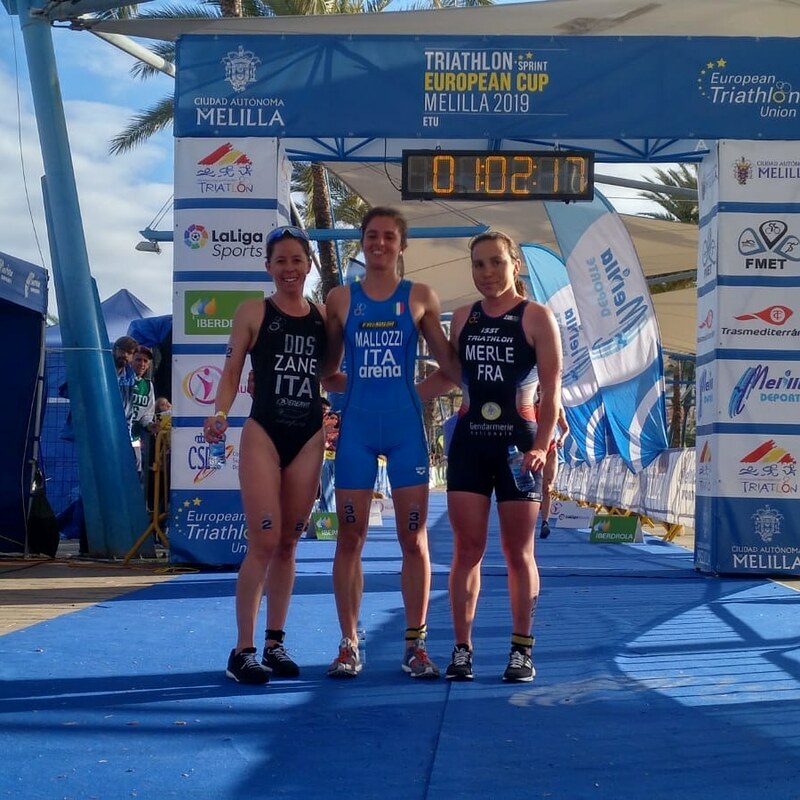 For the Spanish fans, Santamaría’s 4th was a good result against these athletes and showed her continued strong performance. Riasova’s storming run gave her 5th. The top ten showed 4 Italian athletes – the delight from FITRI earlier today will now know no bounds. Despite all the problems of the bike not arriving and having to battle hard on the bike, Yelistratova came home in 11th place. We had a chance to speak to the Italian Triathlon Federation President, Luigi Bianchi. He was naturally, delighted with the medal haul, “today’s medals are the result of good progress and hard work to maintain a model of permanent growth, I am really delighted with the performance of our junior athletes.